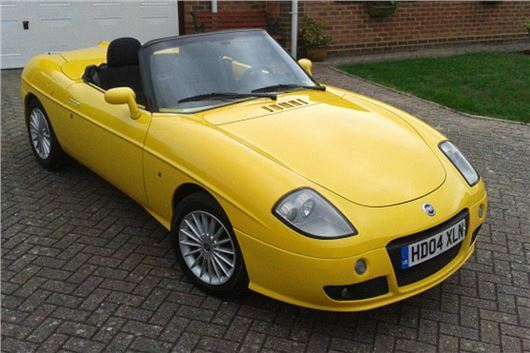 I bought a FIAT Barchetta brand new in 2004, and sold it in 2015. Biggest regret of my life. Last Wednesday I spotted it for sale on Autotrader, and have just bought it back, (with an additional 4,000 miles on it, so now at 47,000). Awesome fun driving it back today. Has brought a smile back to me. I always buy older cars and browse "what’s good/what’s bad" first but I just can’t find it this time. Can you help? Go to /carbycar?/ Then pick the make, then pick the model (scroll down to Used reviews in the Orange banner for non-current models). Once you have clicked on the model, use the nav bar to find Good & Bad (or Buying Guide if the model has been shifted into https://classics.honestjohn.co.uk/reviews/). I have looked through the Dash Cams you recommend. Which one would you advise from the list: front and back? Finally, could you please let me know whom I can I contact to inform them of the wonderful work you do? Products such as dashcams are tested on Honest John Kit. My wife bought a dashcam mirror in Thailand that she is using in her Honda Jazz. It displays the forward camera image in a screen in the mirror and can also be connected to an externally mounted camera at the rear that works as both a reversing camera and a rear impact camera (obviously up until any rear impact smashes it). That was bought as a special offer on Thai TV for about £300, but the box went AWOL before I could write down any details. I’ll try to get more details next time I’m out there as there may be some potential for importing them. I thought I would let you know that my 1997 Mondeo 1.8LX that I have owned for most of its life has done 240k miles on the original clutch. It got me thinking what is the highest on record? Additionally the car still drives very well and the Zetec-e engine feels as if there is no wear at all. I plan to keep it as a daily driver for at least another 2-3 years. I am in the beginning of a very difficult divorce from my husband. I need to sell my 61,000 mile 2012 Nissan Qashqai Ntec diesel, which whilst in good condition throughout and looks lovely, is too much for me to maintain as a single parent. I have a small campervan car which will became my family car, therefore a part-exchange wouldn't be suitable. I have absolutely no idea how to sell the Qashqai whilst attempting to maximise the price. Having read the numerous forums I am now really worried as it seems to be a minefield. I have time to sell privately (if it takes weeks, not months) but with diesel cars now seeming unpopular, will this drive the price down (especially when they see I am also a single woman) or will it take months if ever, to sell? How would I get any payment so I am not at risk? Do Garage/Trade Dealers only use webuyanycar.com as a guide as suggested by the forums? I don't wish to be fleeced? What would you advise? The simple choice is between webuyanycar.com and wewantanycar.com / As Philip Scofield (representing webuyanycar.com) tells us, it's not worth the hassle of trying to get an extra £500 - £1,000 for the car by trying to sell privately. The buying agencies pay the agreed price within 4 working days and are run by the two leading UK auction houses BCA and Manheim to source stock for their auctions. My Ford Fiesta is 12 years old and has done 47,000 miles. It has been very reliable during that time, but twice in the last five years the following problem arose. I drove out of an incline onto another incline and I think the clutch slipped and I went momentarily out of gear. This was followed by a burning smell, which had disappeared by the next day. The first time it happened, my garage man said it was burning dust. The car drove normally during this and after. I've no wish to change my car, but my friends are urging me to do so. What do you think? The smell will have been due to clutch slip because of the extreme circumstances. But if the car is otherwise running normally, no need to worry. You can detect the demise of a clutch by driving up an incline in a high gear. If the engine appears to be running faster than it normally would be, then the clutch is starting to slip. Ford Fiesta Titanium doing 250 miles a week. Fuel cost, please? Which engine? This tells you what sort of mpg you can expect both for the latest Fiesta from 2017: /realmpg/ford/fiesta-2017 / and the Fiesta 2013 to 2017: /realmpg/ford/fiesta-2013 / To convert mpg to miles per litre, divide by 4.546. Divide your 250 miles by the result. Then multiply by the cost per litre (around £1.30). I own an American built Ford Explorer automatic with 130k miles. The transmission is sealed, so there is no dipstick to check the fluid, etc. The only way the fluid can be changed is by taking it to a Ford dealer. My question is, does the fluid have to be changed? The car runs fine. I am seeking your advice regarding my daughter's 2004 VW Golf that has an engine oil leak. Her local friendly and helpful garage has looked and said that there is nothing to be done and that it won’t pass its MoT when due. My daughter is hard working and needs her car to get to work, but also doesn't earn a huge amount so can't afford a new car. Is there nothing to be done? I have heard of scrap yards that have spares for old cars. Would this be an option? We are elderly and haven't got spare cash to help. Your advice would be most helpful. The new MoT regulations make an oil leak a fail on environmental grounds as well as the fire risk. Whether it can be fixed for sensible money or not depends on where the oil leak is coming from. If it's a crankshaft end seal it could be terminal. If it's merely a gasket, it isn't. I think she needs to get a 2nd opinion from a different garage. I have a 16-year old Ford Fusion 2. I am on my own and need advice for a replacement vehicle of similar size, preferably 5 door hatchback without multiple electronic gizmos which I don’t need, petrol fuel, used vehicle 2 to 3 years old, low mileage, rear seats that fold down as in present car if possible.? Likely cost? The only thing that would make my new-to-me Skoda Yeti perfect would be leather upholstery (it has cloth-covered seats). What would be the best way to go – try and obtain a set of Yeti leather seats from a car breaker? Or get a specialist firm to reupholster the interior in black leather? Would you recommend a company like Seat Surgeons, for example? The simplest way to find someone is to go to http://www.yell.com and look up <car upholsterers and trimmers>. The job usually costs between £1,000 and £2,000. The 19-inch wheels on my 2005 987 Boxster with 235/35 R19 and 265/35 R19 tyres have me forever watching out for potholes, of which there are many in my part of the world. The on-line tyre suppliers have the 18-inch equivalent as 235/40 R18 and 265/40 R18, but I’ve been told that 45 profile tyres of the same size would be ok as well, which sounds all wrong to me. What are the best wheel/tyre size to get a deeper profile on replacement wheels? I would even consider 17-inch if they were to fit. Would they last much longer and would the ride be significantly different? Sizes on the Michelin website are: 17-inch wheels with 205/55 R17 fronts and 235/50 R17 rears; 18-inch wheels with 235/40 R18 fronts and 255/40 R18 rears; 18-inch wheels with 235/40 R18 fronts and 265/40 R18 rears; 19-inch wheels with 235/35 R19 fronts and 265/35 R19 rears. The 17s will last a lot longer and give a more comfortable ride but the steering and handling won't be as razor sharp. I propose buying a not too large SUV for greater seat height and ease of getting in and out. Must have a good automatic and reasonable comfort. I have narrowed it down to a Peugeot 2008 1.2 EAT6, Mazda CX-3 6 speed Skyactiv, Suzuki Vitara 6-speed SZT and Hyundai ix20/KIA Venga. How do the EAT6 and Skyactive gearboxes rate with the torque converters? Which car would you recommend? And is there any other I should consider? I would like a petrol hybrid but cannot find any of reasonable size. Good set of choices. EAT6 and Skyactive automatics are torque converter. The 6-speed torque converter in the CX-3 is excellent and the most well-proven. The EAT6 in the Peugeot is also torque converter with no complaints so far. Some Suzukis are torque converter; others are DCT or automated manual. The Vitara, Swift and Baleno are all 6-speed torque converter, but it's a long drop from the seat of a Vitara to the ground. The KIA Venga and Hyundai ix20 are easier to get in and out of but the transmissions are now DCT. I purchased some woodland five years ago, 90 miles down the M5 from my home in Gloucestershire. I then bought a Volkswagen Tiguan 2.0 litre diesel with 4-wheel drive that has been very satisfactory and has now done 150k. I need the 4-wheel drive for getting into the woodland and for occasionally transporting cordwood back home. I am looking for diesel again, and fairly new (budget £15k-£20k) but do not like the latest model of the Tiguan. I am thinking of a Subaru XV rather than the Forester, which is a bit larger, but have also seen a Mitsubishi ASX, which is 1.8 litres but which can be changed between 2 wheel or 4 wheel drive. The salesman says I would get better economy with this and I wonder whether tyre wear might also be better. I gather from Subaru that they have now stopped making all diesel models and wonder whether this may be a trend across to other manufacturers. Our December 2017 Jaguar XE Prestige 200PS 2.0 petrol has, since we bought it, given off a smell similar to cat wee when the engine is fully warm (10+ miles) and road speed drops below 6mph. The dealer reproduced the smell on 29/1/2018, but could not find the cause. We were assured the car did not have an exhaust leak and told that it was probably spilt wax and, as with some of their demonstrators, would disappear after 2,000-4,000 miles. The smell changed and became considerably worse, often giving rise to throat irritation. Further visits to the dealer resulted in H081 Safety Recall of Faulty Fuel line being performed and discovery of a significant exhaust leak (discussion with Jaguar about defective design of clamp as found on other stock vehicles). A new exhaust was fitted (same design of clamp). Leaks from the new one were rectified by use of sealing compound as advised by Jaguar Engineering. On both occasions the dealer said the cat smell had gone and hotter weather with the air conditioning working strongly stops it appearing. This week after best efforts by the dealer (having demonstrated the smell to their QC on 17/5/2018 with auto ventilation and air con off), with no fix in sight we rejected the car as not being of Merchantable Quality following advice from our Legal Insurance help line. We are now in up to 56 days of limbo while Jaguar Financial Services investigates and decides. Apart from escalating things at the dealer from Service Admin to Aftersales Manager, involving the Jaguar Customer Relationship Centre in has proved a disappointment. Our dream of owning a Jaguar as our first Prestige car has become an ongoing nightmare so any constructive advice you can offer will be much appreciated. Eventually the smell turned out to be bacteria growing on the a/c evaporator, which was replaced. To avoid this, the best thing to do after an air-conditioned journey is to turn the heater to max, which kills off the bacteria and evaporates condensation moisture on which it can grow in the ventilation trunking. If you get a ticket from a so-called parking company in a Lidl car park, as a friend's wife did (she was chatting for too long to the manageress who had lost a baby), and you pay by card, it's worth sending an email/phone call to head office as she did. They could trace her purchase activity back 10 years from her card records and the threat of going for future shopping to a rival made them rescind the "fine". At the end of the day the threat of losing £5,000 a year in sales for overstaying 10 minutes in the car park made them see sense. If more people did this when they got a "fine", the supermarkets would get rid of these leeches. I feel your faith in the bill going through Parliament is most likely misplaced. More than likely many MPs are directors or have shares with these pirates. I agree that Clause 56 of the Protection of Freedoms Act always stank. The judges in Beavis v Parking Eye, Supreme Court, November 2015 ruled on a matter of law, not of moral justice. Most MPs slept through all of this, as did the rest of the country. I knew what was coming before the Bill was enacted, but no newspaper would pick it up, which begs further questions regarding your last point. We live in what is probably the most corrupt country in the World that stupidly thinks it isn't, epitomised by the naivety of many newspaper readers who think that subscribing to an upmarket paper makes them somehow superior. The strange national characteristic of trusting people with posh accents is what make Brits so susceptible to rip-offs. I had a similar problem with wickes, but I have several properties and the threat of spending my next refurbishment project money helped get my last ticket rescinded. I had the temerity to return to the store on the same day, but outside of the no return within 4 hours. camera pcked up 1st entry and 2nd departure. Luckily I had also purchased something elsewhere using the car. Selling a Qashqai - why not put it straight into auction and avoid the car buying site's commision since that's where it will probably end up. Alternatively, Evans Halshaw seem to offer better deals than the sites mentioned. "We live in what is probably the most corrupt country in the World that stupidly thinks it isn't, epitomised by the naivety of many newspaper readers who think that subscribing to an upmarket paper (The Telegraph!?!) makes them somehow superior." "We live in what is probably the most corrupt country in the World that stupidly thinks it isn't, epitomised by the naivety of many newspaper readers who think that subscribing to an upmarket paper (The Telegraph!?!) makes them somehow superior." Epic rantage!
" We live in what is probably the most corrupt country in the World... "
Been to Africa much then, have you, HJ? Read my lips: "We live in what is probably the most corrupt country in the World that stupidly thinks it isn't,"
While I understand the frustration of those who overstay for a few minutes, the alternatives are a charging car park (the nearest ASDA to me refunds the parking fee on presentation of a ticket) OR a car park full of commuters using the 'free' facilities and walking to the nearest station. The latter is why many hospitals charge too, because it's "Our NHS" people regard the hospital as a free to use asset, hence the days when the hospital car parks were full at 8:30am, commuters going to the nearest station. I'm pretty sure Kia Vengas have only ever had Torque Converter automatics. A 4 speed up until the facelift in 2015 and currently a 6 speed. Other Kias have a DCT but talking with my dealer when I bought mine he reckons Vengas remained with TC auto's. Kia Venga automatics are now being delivered with a 6-speed dual clutch transmission rather than the previous 4-speed torque converter automatic. On Venga 4, 7 year warranty also includes 7 free annual map upgrades for the SatNav. Traffic warnings are accurate and the recalculation speeds are almost instantaneous. As much as I hate ParkingEye, I hate the nobs who park in the disabled bays even more. On my last trip to Lidl on Wednesday evening, every single disabled bay had a luxury car, or SUV parked in it, yet not one had a disabled badge. Despite being unemployable, due to (at least), three chronic illness's, I am not considered ill enough to qualify for state aid, or even a disabled badge. On subject of sticking a label onto said windscreens, I personally use double sided tape. Must more convenient and much harder to remove. Never fails to stop the bad parking habits of luxury SUV owners.